When there's a new niece or nephew on the way, I try to knit one sweater for them before they are born. 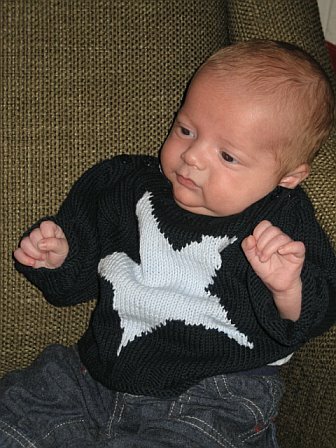 When I asked Jason's sister what sweater she wanted for not-yet-born Cal, she asked for the the same star sweater that I made for Robbie before he was born. She even wanted the same colors! In an effort to add something new into the knitting of this sweater, I knit it with Dale of Norway Stork instead of the Rowan 4-ply cotton called for in the pattern. The yarn was a delight to knit with - stitches came out even and it's so soft. I finished it and gave it to Cal at Christmas, and waited for the knitting boomerang. This week, it arrived! Baby Callum, fat and happy in his Tia sweater.